Adlene Guedioura can be the source to reunite Nottingham Forest fans with the ‘loving feeling’ as he returned to the City Ground on deadline day. The transfer may have been completed seven days ago and was part of the squad that lost 2-0 away to Fulham at the weekend but the fans are still eager for his first game back at Trent side. All the seven new January signings can all play a massive part in ensuring the Reds don’t repeat last season’s ending this year but Guedioura may hold the key to the Forest faithful’s heart. This is the Algerian’s third spell in the Garibaldi red and will be hoping to better his previous successes for the club he calls ‘home’. Forest may have been going through turmoil off the field during his previous two spells as the club was passed around three different chairmen but his time on the pitch does remind fans of the better times – especially his second and permanent spell there. Guedioura spent 18 months at the City Ground, spreading across two consecutive seasons and in his second term in the 2012/13 campaign the side ended up eighth. 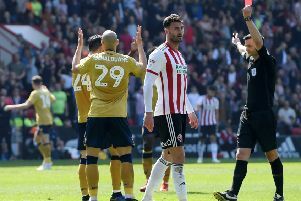 The season did end in heartbreak on the final day, missing out on a play-off spot, but looking back fans now would still wish that they were fighting up at that end if the table rather than the other. Guedioura’s return reminds fans of happier and positive times the club have endured this century and reminds them that the team are capable of a promotion push. Before he had even kicked a ball in the famous red shirt again hundreds of fans were expressing their excitement and joy of the signing across social media, one of the best reactions of a newcomer for some time. Dozens of young reds fans opted to change the Twitter profile images to one of him from the club’s official site announcing his return and thousands liked a special video the side posted on Facebook to commemorate his return. Happy reactions across their entire network setup has been often too rare for Nottingham Forest this season. His previous time at the club was made famous by his spectacular long-range goals which made him an instant hit with the fans and one even won Goal of the Season for his astonishing 35-yard strike against Leeds United. He was always praised for giving his all for the club and previous manager Steve Cotterill described him as playing with his ‘heart and soul’ at Forest. Guedioura also fills a void that the Forest midfield is seriously lacking, a solid, experienced and strong-minded midfielder that plays in the centre of the park. Liam Bridcutt and Kieron Dowell are equally talented players however with them both playing at the opposite end of the midfield spectrum the arrival of Guedioura fills a whole in the middle of it. He is tactical, composed and the capability to control a game – and his trademark long range shot can be a help for any team. But it wasn’t just the signing of Guedioura that manager Aitor Karanka got correct for his side in January - the other six are just as crucial themselves. Forest have lacked a talented bench that the manager and fans can rely upon to enter the game and make a difference, something this season’s subs have failed at. The likes of Lee Tomlin and Joe Lolley may be amongst the new faces that may find themselves in that position but will reassure and put the fans more at ease knowing Karanka has the quality of them two to bring on rather than some of the previous players he had to turn to. The new signings such as Jack Colback and Tobias Figueiredo can also push their way into the starting 11 and pressure the players who have been playing in their position for the previous six months. Several of the current starting 11 appear to have gotten comfortable in their familiar and often starting positions but with new players eager to get game time and snapping at their heels Forest will also see an increase in quality of those already at the club.